October 4, 2010 - by InterestingFacts.org - 9 Comments. The festival works in that the people feed crocodiles and dance and sing. However, it is the dangling part of the festival that makes this stand out. 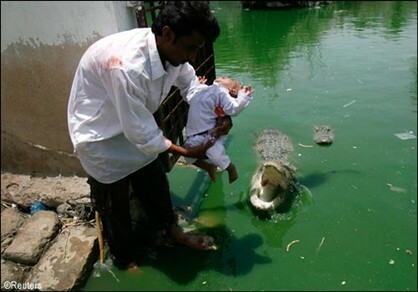 A father will take his baby son and dangle it above the jaws of a crocodile. This is done to find blessings for the child. During this festival the people will also make pledges to the shrine. These pledges are given to the crocodiles. The pledges consist of fresh goat meat. When the crocodiles accept the meat it will be seen as a sign of luck. They suggests that the crocodiles will not attack because they are disciples of the saint known as Khwaja Hasan. wow, way to hate on other cultures. assuming that as english speakers you come from judeo christian values, will i remind you that certain groups, it is believed that eating an apple damned everyone to hell, and murding god saved them. just saying. Shrine is near Manghopir ..